Ok, we know it's a little silly, but growing giant pumpkins is good, geeky fun. 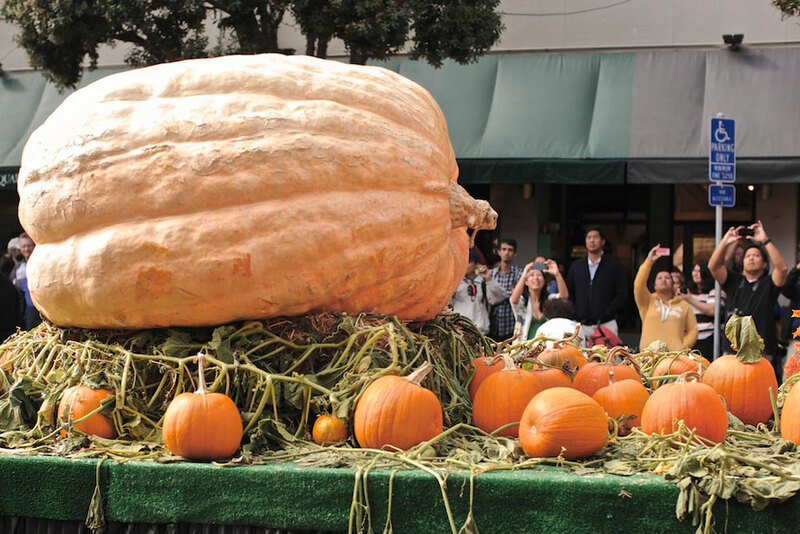 The bar gets higher almost every year – the 1,000-pound mark was first breached around the turn of the millennium; the current world-record pumpkin weighed in at 2,323.7 pounds, grown by a German gardener in 2014. World champion growers have turned what was once an innocuous 4-H hobby into a professional pursuit, with big cash prizes instead of just blue ribbons, the seeds of world champion specimens fetching upwards of $1,000 each. But that shouldn’t deter you from seeing how big of a pumpkin you can grow just for the fun of it, not to mention the bragging rights you’ll accrue. If you want a giant pumpkin next fall, don’t wait until spring to get ready, you have to start preparing the ground now. It’s a race to provide the longest possible growing season and funnel as much nutrients and water as possible into a single pumpkin, all while making sure there are no mishaps with pests, disease, or errant kids, pets, or livestock trampling the plant. The first step in growing giant pumpkins is to obtain the right seed. One-thousand-plus pound pumpkins generally result from high-pedigree hybrid seeds, which circulate among the most serious growers and cost from $10 to $100 or more per seed. But virtually all giant pumpkins are descended from a variety called Dill’s Atlantic Giant, which is widely available from seed companies and sells for typical seed prices. Three hundred- to 500-pound specimens are routinely grown with this variety, but you still have to work at it – growing a giant pumpkin requires in-depth horticultural knowledge, a daily dose of TLC for the plant, and, well, a lot of luck. In the fall, till up a 10-foot diameter bed in a sunny, well-drained spot with rich garden soil. Eight or more hours of sun is a must, and if the area is protected from wind by shrubbery or structures, that’s even better. Spread 6 inches of composted cow manure over the bed and till it in. This will be the base of fertility for the giant pumpkin next year. Sculpt the bed into a low broad mound, like a pitcher’s mound, and cover it for the winter with a straw mulch or a cover crop. In late winter/early spring, start the pumpkin seeds in peat pots about a month before the average date of last frost in your area. Cover the seedling with a cold frame to protect it from late frosts and to warm up the ground, which encourages the pumpkin plant to start growing. This is essentially a mini-greenhouse, but it doesn’t have to be fancy – four stakes with clear 6-mil plastic sheeting stapled over top is sufficient. The cold frame should cover at least a 4-foot diameter area around the young plant. Check soil moisture daily. The ground needs to be evenly moist – but not soggy – at all times. Wetting the leaves encourages fungal problems, so always water at ground level (a drip system is ideal for this). Fertilize with light doses of nutrients weekly. In the first third of the growing season, concentrate on high nitrogen sources, such as fish emulsion; in the middle third, increase the phosphorus content with products high in bone meal; in the third phase, use products high in potassium, such as greensand. Provide trace minerals with kelp meal throughout the season. For an in-depth discussion of fertilizing techniques for giant pumpkins (including the use of conventional fertilizers – those listed above are organic) click here. Maintain a weed-free zone around the pumpkin plant throughout the growing season. Monitor for pests and disease on a daily basis and apply insecticides and fungicides as soon as they appear. If the growing area is exposed to wind, install a low fence around the pumpkin plant to prevent leaf damage and desiccation. You need the leaves to remain large and supple to provide maximum photosynthetic energy. Pick off all flower buds until the pumpkin vine is about 10 feet long. This allows the plants to grow more and larger leaves, which will then support rapid growth of a single pumpkin. After the vine’s 10 feet long, allow several flowers to develop into pumpkins, but remove all but the largest fruit after several weeks of growth. Spread a bed of sand under the chosen pumpkin to keep it out of contact with the moist earth below. This is essential for preventing rot. Gently adjust the chosen pumpkin so the stem is at a perpendicular orientation to the vine. The stems usually start out with an acute angle to the vine, but they are prone to breaking in this arrangement once they become brittle later in the season. Erect a canopy of shade cloth over the chosen pumpkin. In full sun, the skin of the fruit hardens earlier, restricting its ultimate size. Remove the rootlets that form along the vine for several feet on either side of the pumpkin as it develops. The vine needs to lift freely from the ground as the pumpkin grows, which is prevented by the small roots that form naturally on all pumpkin plants. Spread a couple inches of soil over roots that form along other parts of the vines to encourage a larger root system. Water and fertilize the soil under all the vines, not just the main root system, to encourage maximum uptake. Prune the lateral vines that develop off the main vine once they reach about 8 feet in length. Though, in general, you want as many leaves as possible to feed energy to the growing pumpkin, the plant begins to divert more energy to vine growth (rather than fruit growth) if the vines are allowed to grow to an excessive length. 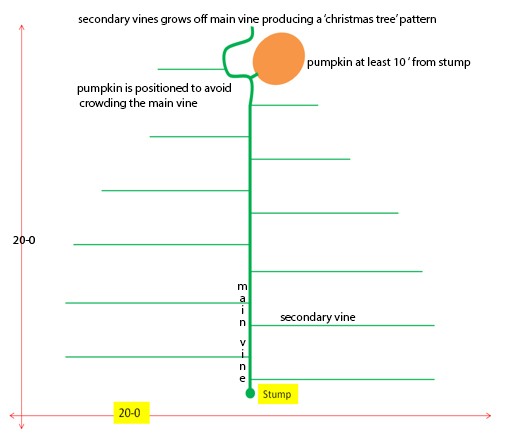 Many pumpkin growers recommend training the vines into a Christmas tree format, where the longest lateral vines are closest to the planting location, becoming shorter as they move toward the growing tip. If you can keep up the TLC regime until the first frost of fall (when the leaves will turn brown and die), you should end up with a massive pumpkin. At this point, clip the pumpkin from its stem and find a few friends to help you roll it onto a scale. Most importantly, don’t let all that food go to waste – the giant varieties are suitable for soups, pies, muffins, and any other recipe calling for pumpkin. thank you for including me on your weekly publication. Thank you for the instructions. I shared them with neighbors and started a big pumpkin contest 2 years ago. Started with 4 families, grew to 12 families our 2nd season in 2018. We celebrate with a fun judging contest followed by a neighborhood cookout. Looking for a recommendation: I have poor clay soil, highly alkaline. What’s the best fertilizer to add now while the ground is frozen and snow covered?